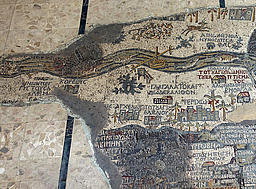 The mosaic map of Madaba from the second half of the 6th century is one of the most important archaeological finds in Western Asia and one of the oldest evidence of ancient cartography. It was discovered at the end of the 19th century during the construction of St George's Church on the foundations of a Byzantine church. 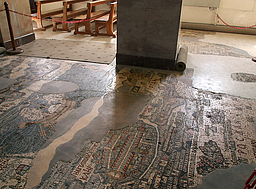 About a quarter of the original mosaic has been preserved. The map covered the area from Lebanon in the north to the Nile delta in the south, and from the Mediterranean Sea to the desert in the east. The Jordan Valley and the Dead Sea form the central north-south axis. The representation of Madaba was unfortunately lost. It lay in the most important segment of the map directly in front of the pulpit, in line with Jerusalem. 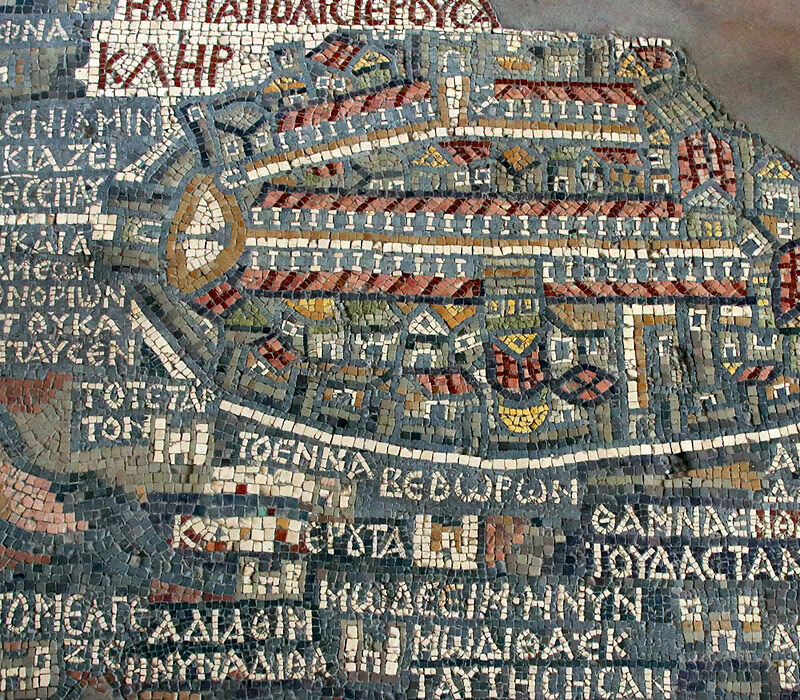 The mosaic map was not conceived as a practical orientation aid for pilgrims, but as a complex work of Christian art with several layers of meaning. The biblical cartography of Christian salvation and redemption is linked to "the idealistic, liturgical level of the exemplary image of an earth blessed by God" (R. Warland). According to calculations, the mosaic map was originally approx. 15.6 m x 6 m in size and consisted of an estimated 2.3 million mosaic stones. By means of a fragment of Phoenicia in the left side aisle of the church, it was possible to reconstruct the extention over the entire width of the floor. 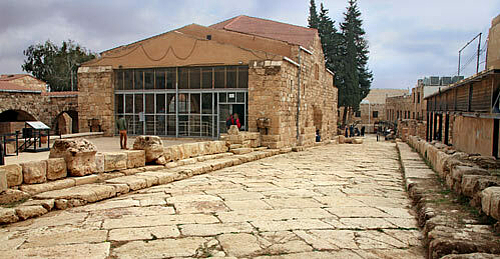 Another isolated fragment (Galilee) lies in front of the third pillar of the northern pillar row. The part of the map which can be seen reaches north (left) up to the Jordan valley and south until the Nile delta (to the right, behind the pillar). Standing directly in front of the mosaic, one looks from the Mediterranean coast to the east. In the furthest east (above) is Karak (Charachmoba). The well preserved cityscape of Jerusalem is located quite exactly in the central spatial axis. A total of 157 remaining Greek inscriptions are names of places, quotations from the Bible and commentaries. Large widely spread letters in red denote territories of the tribes of Israel. For the marking of towns and villages the mosaicists used symbols of Hellenistic-Roman origin, common in the Mediterranean region. Smaller towns often appear as gates flanked by towers or just as a single house. Larger cities are depicted from above, partly surrounded by walls and with some recognizable buildings and colonnaded streets. The mosaicists also added easily understandable symbols for other elements, such as brown brindled bulges for mountains, palm trees for oases and springs, trail bridges across the Jordan and bushes on its banks, fish in running water. On our image pages you can find many places and details of the Madaba map localized and described. R. Warland pointed out that the overarching idea of an Earth blessed by God is articulated at a predominant spot on the mosaic map. Just to the left of Jerusalem is a quote from the Blessing of Moses: "Benjamin, the Lord covers him and here sted amongh is frontiers" (Deuteronomy 33:12). And next to this, the blessing for Joseph is even more strongly emphasized in large letters on a colored background: "Joseph, God blessed you, with the benediction of the earth which sustains everything, and again by the benediction of God his earth" (Deuteronomy 33:13). 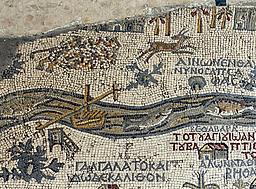 The (no longer existing) representation of Madaba was positioned in the most important segment of the mosaic directly in front of the pulpit, in an axis with Jerusalem. From this it can be concluded that the city itself was a theme of the work of art, as is also known from other late antique church mosaics. 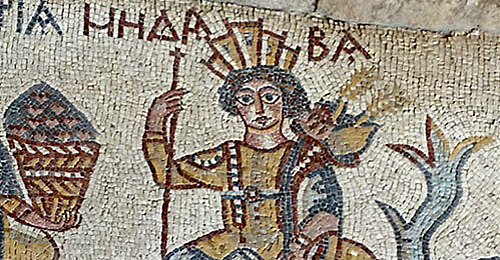 The Madaba map was also about the "assurance of stability and prosperity for the city, which was located directly in front of the altar in the head field of the earthly image" (Rainer Warland) and was to be perceived as an integral and particularly important part of the biblical region. 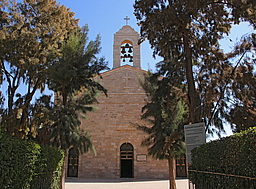 In the early 1880s about 2000 Christian Arabs moved from Karak to Madaba, where many of their ancestors came from. Despite the resistance of local tribes, they settled in the area assigned to them by the Ottoman authorities at the request of the Patriarch of Jerusalem. After the first difficult years, when it became clear to everyone that they would remain in Madaba, they started thinking of permanent buildings for their religious and educational needs, i.e. for a church and a school. Thus, they applied to their spiritual leader, the Greek Orthodox Patriarch in Jerusalem. According to Ottoman law, permission for a new church was granted only if in that place had existed a church in antiquity…. In the firman of the Sultan Suleiman to the Patriarch of Jerusalem Germanos (1537-1579), it is stated precisely that the Greeks are allowed to rebuild their churches according to their old position and form. When the newcomers began digging in the ruins of a Byzantine church in 1884, they came across a coloured mosaic, but it was not excavated. Two years later, Greek mosaic inscriptions were reported without knowing what they beloged to. 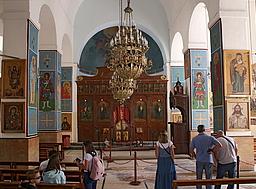 In May 1892, the Holy Synod, in favour of the request of Madaba's community, decided to construct a church in this town and applied to the government for the relevant permission. Due to disputes with Bedouins in the village, among other things, the building permit was not granted until the end of September 1894. Led by the architect of the Patriarchate, Athanasios Andreakis, work on the new building began in 1894 with the excavation of the foundations of a Byzantine church. Originally, the new Greek Orthodox church was dedicated to Saint James, called "brother of Christ", who served as the first bishop of Jerusalem, but it became known as the Church of St. George. 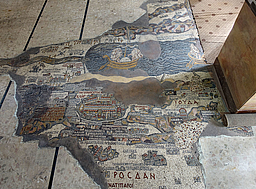 After the outer walls and roof of the new church were completed, workers cleared the floor in September/October 1896 and discovered the Madaba Map. 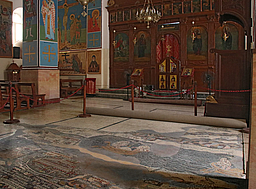 On 13 December 1896, Cleopas Koikylides, a young scholar fond of archaeology, entered the church to examine the mosaic on behalf of the Patriarchate. 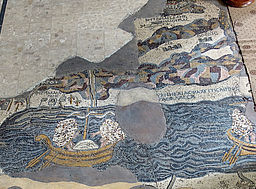 After he cleaned it of rubble and dirt, he was astonished at the sight of this amazing find, for he immediately recognized the uniqueness and extraordinary significance of such an early mosaic map of the Holy Land. He measured it, and made an accurate and reliable preliminary drawing on graph paper and, full of enthusiasm, returned to Jerusalem where he gave a complete report to his superior. In January 1897, the Patriarchate ordered special protective measures for the mosaic and sent to Madaba its most qualified person, Professor G. Arvanitakis from the Holy Cross School of Theology, accompanied by its representative to Madaba deacon Germanos, with the order to make a precise copy of the mosaic map. News of the discovery spread rapidly and a race began among the different archaeological expeditions in Jerusalem to see who was going to be first to examine and publish this important monument. 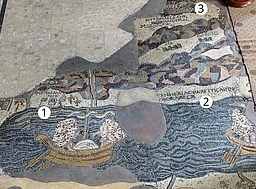 The last basic restoration of the Madaba mosaic map was undertaken in 1965 by the German Society for the Exploration of Palestine (Deutscher Verein zur Erforschung Palastinas), represented by Professor Herbert Donner of Gottingen University and his collaborators, the restorers Dr. Heinz Cuppers and Mr. Heinrich Brand.